Natural tooth powder that works to maintain healthy teeth, gums and the whole mouth. 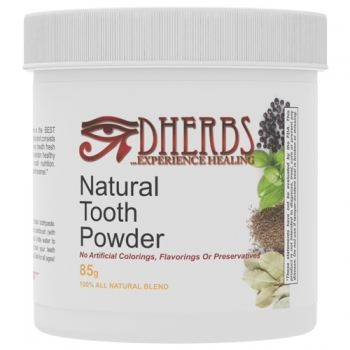 Dherbs Natural Tooth Powder is the BEST natural tooth powder on the market and consists of 100% herbs that will leave your breath fresh and clean. This powder helps maintain healthy teeth, gums, and assist in mouth nutrition. Carbon whitens and polishes tooth enamel. Apply natural brand of toothpaste to your toothbrush, dip toothbrush (with toothpaste on it) into container, add a little water to the powder/toothpaste mix, and begin to brush your teeth thoroughly. Use daily for best results. Safe for all ages.